Rare vintage hand painted Bengali film poster of the classic Indian movie, Baba Taraknath (1977) for sale. This is an actual surviving old publicity film poster of the 1977 old Bengali movie directed by Ardhendu Chatterjee. Printed and circulated during the first release of the film (somewhere in the late 1970s), this old Bengali poster was printed for publicity but never ended up being used. This old Bengali film poster was originally hand painted using oil paints on canvas, making it highly collectible.. The design of this hand painted Bengali poster captures the lead actress in a stunning portrait as she makes her journey towards a temple. Another temple is seen in the background, signifying the religious undertone of this old Bengali film. The typography used on the top is simply stunning. A face can be seen masked within the letters, giving it a very artistic look. Baba Taraknath is a old Bengali film released in 1977 starring Sandhya Rani, Bharati Debi, Gita Dey, Chhaya Debi Biswajit, Sukhen Das, Santu Mukherjee, Anup Kumar, Gurudas Banerjee and Satya Banerjee. 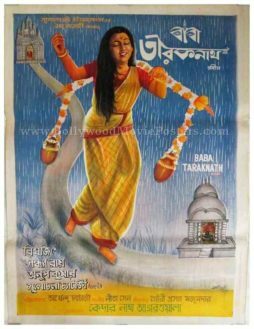 Rare old Bengali movie poster of the classic film, Baba Taraknath (1977) for sale. This is an actual surviving vintage publicity poster of the 1977 old Bengali movie directed by Ardhendu Chatterjee. 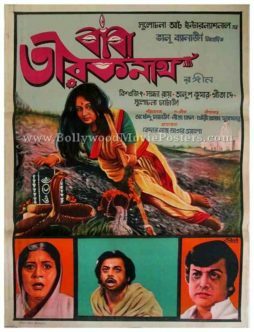 Printed and circulated during the first release of the film (somewhere in the late 1970s), this old Bengali film poster was printed for publicity but never ended up being used. This old Bengali movie poster was originally designed in hand painted oil on canvas format, making it highly collectible.. The design of this hand painted movie poster captures the lead actress in a stunning portrait on the top. A temple is seen in the background, whereas a snake and Shiv Lingam appear in the foreground, signifying the religious undertone of the film as well as the story of the lead protagonist’s near death experience with snake venom. The other three supporting actors are seen in smaller portraits inside boxes at the bottom, giving this old Bengali film poster a very appealing classic touch. Baba Taraknath is an old Bengali movie released in 1977 starring Sandhya Rani, Bharati Debi, Gita Dey, Chhaya Debi Biswajit, Sukhen Das, Santu Mukherjee, Anup Kumar, Gurudas Banerjee and Satya Banerjee.